“GUTEN MORGEN, said Jan-Paul Reinke the conductor of Germany’s Mannheim Youth Symphony Orchestra as he embarked on a rehearsal this morning. Giggles all around. “Stop… there is a journalist here.” You could have heard a pin drop. 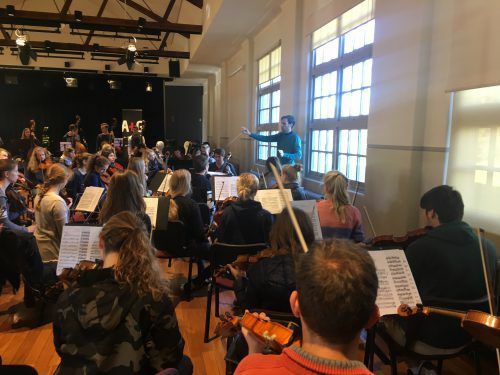 The orchestra of 68 instrumentalists arrived in town yesterday as part of a 10-day tour of Australia which sees them join 65 Canberra Youth Orchestra players this Saturday night in Llewellyn Hall. 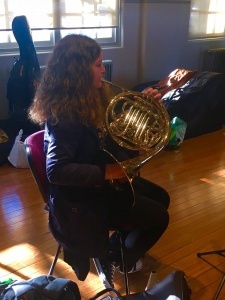 By 9.07am, the kids from Mannheim were right into it, as the stirringsounds of Richard Strauss’ “Thus Spake Zarathustra” (best known from Stanley Kubrick’s film, “2001: A Space Odyssey”), resonated through the main hall at the Ainslie Arts Centre. Ulrike Ballreish, tour manager and mother of three of the visiting musicians, said Reinke was “tough but fair”. The way he cut through the giggles with one word was evidence of this, but as the rehearsal progressed, there were plenty of opportunities for laughter as he fine-tuned the details of the coming performance. Artistic director of host organisation Music for Canberra, Kathleen Grant, told “Citynews” she was pleased with the way the Canberra community had pooled together to billet the visitors around the ACT, also praising the assistance of the German Government in securing Llewellyn Hall for Saturday and the ongoing support of Ainslie and Gorman Art Centres. Perhaps best of All, the ANU was partnership with them to live-stream Saturday’s concert Britain, South America and South Africa from which, as it happened, CYO player Charles Barnes parents’ would be able to hear him play. While Ballreish and tour bursar Ute Gubbe concentrated on touring matters like collecting a violin accidently left behind in Sydney, CYO conductor Leonard Weiss arrived to busy himself with music stands. The Australian pronunciation of his obviously Germanic surname was causing some amusement among the German visitors. “Jan-Paul,” he explained, “will conduct the Mannheim Orchestra in the first half of the program then I will take over with both orchestras for the second half, Tchaikovsky’s Symphony No.6 “Pathétique. But just so Weiss doesn’t get all the limelight, Reinke will step in again for the aforementioned “Thus Spake Zarathustra” in a smashing finale. 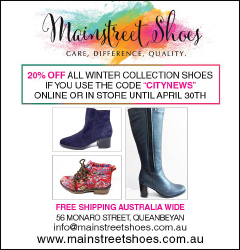 Next articleWhat’s on and where in the arts in Canberra this weekend! SAMARA PURNELL enjoys some emotive and exhausting routines from young dancers.